Vivaproducts has been supplying the highest quality products to the clinical diagnostic marketplace for over 20 years. In 2008 we began offering new products for the purification of DNA in the forensic laboratory market. Our strong relationship with Sartorius Corp. will help us continue to expand our product offerings to include high quality instruments and equipment for the benefit of our customers. 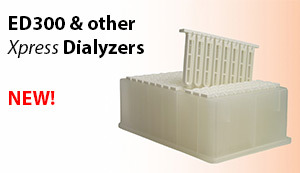 We provide the widest assortment of concentrators to commercial and hospital labs. Our products are consistent and efficient and our customers rely on our prompt service and delivery. Centrifugal and static products to concentrate proteins in urine and spinal fluid as well as bacterial antigens and fungal antibodies in urine and serum samples. Centrifugal devices may also be used to separate free drugs and hormones from bound serum proteins. Centrifugal devices that are used for a variety of research purposes including antibody and protein concentration and purification. NoEndo gel products may be used to remove endotoxins from proteins produced by recombinant bacteria or by mammalian cell culture. Centrifugal products that are used for DNA concentration and buffer exchange for forensic samples. DNA profiles are available for all personnel involved in the manufacture and handling of these products. ETO treated devices are offered as an option to eliminate stray DNA contamination.